A team lead by Kevin Kit Parker, Ph.D. at Harvard University’s Wyss Institute for Biologically Inspired Engineering recently developed a nanofiber fabrication technique to rapidly manufacture heart valves with regenerative and growth potential. In a paper published in Biomaterials, Andrew Capulli, Ph.D. and colleagues fabricated a valve-shaped nanofiber network that mimics the mechanical and chemical properties of the native valve extracellular matrix (ECM). To achieve this, the team used the Parker lab’s proprietary rotary jet spinning technology – in which a rotating nozzle extrudes an ECM solution into nanofibers that wrap themselves around heart-valve-shaped mandrels. “Our setup is like a very fast cotton candy machine that can spin a range of synthetic and natural occurring materials. In this study, we used a combination of synthetic polymers and ECM proteins to fabricate biocompatible JetValves that are hemodynamically competent upon implantation and support cell migration and re-population in vitro. Importantly, we can make human-sized JetValves in minutes – much faster than possible for other regenerative prostheses,” said Parker. 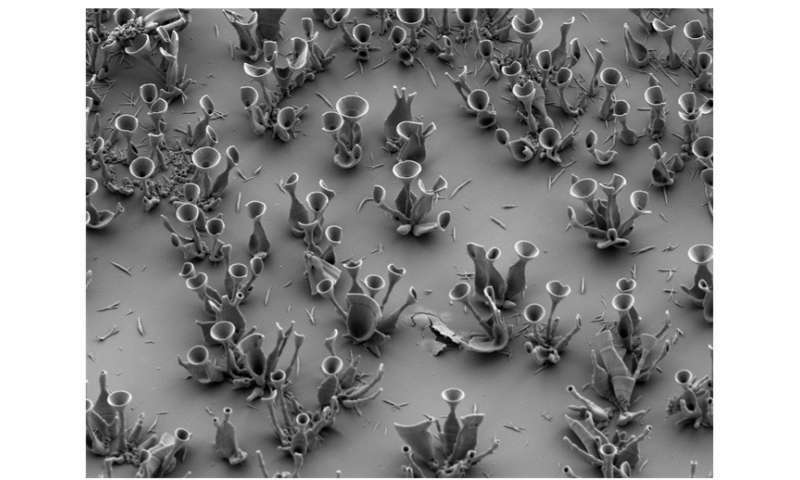 This scanning electron microscopy image shows how extracellular matrix (ECM) nanofibers generated with JetValve technology are arranged in parallel networks with physical properties comparable to those found in native heart tissue. Credit: Wyss Institute at Harvard University. Personal Genome Project will integrate brain training tests to help identify key memory genes towards understanding neurodegeneration. Researchers at the Wyss Institute for Biologically Inspired Engineering and Harvard Medical School (HMS)’s Personal Genome Project (PGP) announced today a new collaboration with Lumos Labs, makers of brain training program Lumosity. The PGP-Lumosity memory project aims to leverage the PGP’s and Lumos Labs’ unique resources and expertise to investigate the relationship between genetics and memory, attention and reaction speed. Wyss scientists plan to recruit 10,000 members from the PGP which started in 2005 in the laboratory of George Church, PhD, a founding Core Faculty member of the Wyss Institute and also Professor of Genetics at Harvard Medical School. Participants in the PGP publicly share their genome sequences, biospecimens and healthcare data for unrestricted research on genetic and environmental relationships to disease and wellness. Wyss Institute researchers will use a select set of cognitive tests from Lumos Labs’ NeuroCognitive Performance Test (NCPT), a brief, repeatable, accessible web-based alternative to traditional pencil-paper cognitive assessments to evaluate participant’s memory functions, including their ability to recall objects, memorize object patterns, and response times. Church’s research team at the Wyss Institute and HMS Postdoctoral Fellows Elaine Lim, Ph.D., and Rigel Chan, Ph.D., will correlate extremely high performance scores with naturally-occurring variations in the participants’ genomes. “Our goal is to get people who have remarkable memory traits and engage them in the PGP. If you are exceptional in any way, you should share it not hoard it,” said Church. To validate their findings, the team will take advantage of the Wyss Institute’s exceptional abilities to sequence, edit and visualize DNA, model neuronal development in 3D brain organoids ex vivo, and, ultimately, to test emerging hypotheses in experimental models of neurodegeneration. Drs. Church, Lim and Chan plan to begin recruitment for this study in early March. The PGP-Lumosity memory project is the latest in a long line of exciting research collaborations supported by each platform. Through their Human Cognition Project, Lumos Labs is currently working with independent researchers at over 60 different institutions and investigating a range of topics, including normal aging, certain clinical conditions and the relationship between exercise and Lumosity training. Existing collaborative projects available to PGP participants include stem cell banking with the New York Stem Cell Foundation, “Go Viral” real-time Cold & Flu surveillance, the biology of Circles with Harvard Medical School, Genetics of Perfect pitch with the Feinstein Institute for Medical Research, characterizing the human microbiome in collaboration with American Gut, and discounted whole genome sequencing strategies. With the PGP’s aim to serve as a portal that empowers the public to drive scientific discovery through their participation, this collaboration is a synergistic convergence of two uniquely positioned organizations that combine science with broad outreach. “What excites us about this project is opening up groundbreaking technologies developed at the Wyss Institute to explore the relationship between genetics and memory with possible implications for Alzheimer’s and other diseases,” said Wyss Institute Founding Director Donald Ingber, M.D., Ph.D., who is also the Judah Folkman Professor of Vascular Biology at Harvard Medical School and Boston Children’s Hospital, and Professor of Bioengineering at Harvard SEAS. Enteroviruses enter the human body through the digestive or respiratory tract and from there spread to other sites in the body where they can cause a variety of serious health threats including meningitis, pancreatitis, myocarditis, the death of motor neurons, and perhaps even help trigger diabetes. However, they remain a challenge to study because they cannot be grown in conventional human cell cultures. Yet, understanding how enteroviruses invade gastrointestinal cells, multiply within them, and are released to other sites in the body could be key to ending the present dearth of specific anti-viral therapies and vaccines. As shown in these immunofluorescence images, the research team recapitulated the typical epithelial microvilli architecture of the human gut in a microchannel of a microfluidic chip with cell nuclei shown in blue and the cytoskeleton that enables each cell to assume and maintain its shape in the microvilli structure shown in red (left image). Upon infection with a clinical Coxsackievirus B1 strain (green), the epithelium produced and secreted additional viral particles that induced the break-down of the tissue’s normal architecture. Credit: Wyss Institute at Harvard University. Towards solving this problem, a multidisciplinary team of tissue engineers and biologists at Harvard’s Wyss Institute for Biologically Inspired Engineering working alongside scientists from the Molecular Virology Team at the U.S. Food and Drug Administration (FDA)’s Center for Food Safety and Applied Nutrition now have leveraged the Wyss Institute’s previously developed human gut-on-a-chip to mimic the entry, host cell-interaction and multiplication of a pathogenic clinical strain of Coxsackievirus using gut epithelium outside the human body. Their findings are reported in PLoS One. “We teamed up with FDA researchers to show for the first time that an enterovirus can be successfully cultured in a microfluidic human Gut Chip system. We were excited to find that the organ-on-a-chip approach offers a potential new way to study these viral pathogens under more physiologically relevant conditions in vitro,” said the Wyss Institute Founding Director Donald Ingber, M.D., Ph.D., who led the team. Ingber also is the Judah Folkman Professor of Vascular Biology at Boston Children’s Hospital and Harvard Medical School, and Professor of Bioengineering at the Harvard John A. Paulson School of Engineering and Applied Sciences (SEAS). “Now that we have a functional minimal system in place that replicates typical host-pathogen interactions, we can start to vary the type of intestinal cells, include immune cells that may contribute to the host response to infection, or create tissues using human stem cell-derived intestinal cells to tease out virus specificities and requirements for infection,” said Ingber. First developed in 2012, the Wyss Institute’s human gut-on-a-chip is a transparent, hollow-channeled microfluidic device the size of a computer memory stick that recapitulates the gut microenvironment. Human intestinal epithelial cells are cultured in a microchannel on a porous membrane that separates them from a parallel microchannel that mimics a neighboring capillary blood vessel. Fluid with or without viruses is flowed through both channels and exchanged through the pores of the membrane. Suction forces are also applied to parallel hollow channels, which produce cyclic deformations in the tissue that mimic intestinal peristalsis-like motions. This culture approach results in the growth of a fully differentiated gut epithelium that exhibits three-dimensional finger-like villus structures and that harbors all of the relevant cell types of the small intestine. In 2015, the team added more complexity to their biomimicking device by co-culturing a capillary endothelium on the lower surface of the membrane as well as a bacterial gut microbiome on the lumen of the epithelial channel to model aspects of human intestinal inflammation. Besides Villenave and Ingber, the article is also authored by FDA researchers Samantha Wales, Efstathia Papafragkou, Christopher Elkins and Michael Kulka. Additional authors are Tiama Hamkins-Indik, James Weaver, Thomas Ferrante and Anthony Bahinski, who at the time of the study were affiliated with the Wyss Institute. Model allows researchers to study how diseases like schizophrenia impact different regions of the brain simultaneously. Researchers from the Wyss Institute and the Disease Biophysics Group at SEAS modeled three regions of the brain most affected by schizophrenia — the amygdala, hippocampus and prefrontal cortex. The image shows how the Discrete Molecular Imaging (DMI) technology visualizes densely packed individual targets that are just 5 nanometer apart from each other in DNA origami structures (see schematics on the left). The image on the top right shows a DMI-generated super-resolution image of a clear pattern of individual signals. In the image on the bottom right, three different target species within the same origami structure have been visualized using Exchange-PAINT-enhanced DMI method. Credit: Wyss Institute at Harvard University. Proteins mostly do not work in isolation but rather make up larger complexes like the molecular machines that enable cells to communicate with each other, move cargo around in their interiors or replicate their DNA. Our ability to observe and track each individual protein within these machines is crucial to our ultimate understanding of these processes. Yet, the advent of super-resolution microscopy that has allowed researchers to start visualizing closely positioned molecules or molecular complexes with 10-20 nanometer resolution is not powerful enough to distinguish individual molecular features within those densely packed complexes. “The ultra-high resolution of DMI advances the DNA-PAINT platform one step further towards the vision of providing the ultimate view of biology. With this new power of resolution and the ability to focus on individual molecular features, DMI complements current structural biology methods like X-ray crystallography and cryo-electron microscopy. It opens up a way for researchers to study molecular conformations and heterogeneities in single multi-component complexes, and provides an easy, fast and multiplexed method for the structural analysis of many samples in parallel” said Peng Yin, who is also Professor of Systems Biology at Harvard Medical School. DNA-PAINT technologies, developed by Yin and his team are based on the transient binding of two complementary short DNA strands, one being attached to the molecular target that the researchers aim to visualize and the other attached to a fluorescent dye. Repeated cycles of binding and unbinding create a very defined blinking behavior of the dye at the target site, which is highly programmable by the choice of DNA strands and has now been further exploited by the team’s current work to achieve ultra-high resolution imaging. “By further harnessing key aspects underlying the blinking conditions in our DNA-PAINT-based technologies and developing a novel method that compensates for tiny but extremely disruptive movements of the microscope stage that carries the samples, we managed to additionally boost the potential beyond what has been possible so far in super-resolution microscopy,” said Mingjie Dai, who is the study’s first author and a Graduate Student working with Yin. In addition, the study was co-authored by Ralf Jungmann, Ph.D., a former Postdoctoral Fellow on Yin’s team and now a Group Leader at the Max Planck Institute of Biochemistry at the Ludwig Maximilian University in Munich, Germany. In this image the “Wyss!” name has been visualized in a DNA origami display with the so-far highest resolution possible in optical imaging using Discrete Molecular Imaging (DMI) technology. Credit: Wyss Institute at Harvard University. “Peng Yin and his team have yet again broken through barriers never before possible by leveraging the power of programmable DNA, not for information storage, but create nanoscale ‘molecular instruments’ that carry out defined tasks and readout what they analyze. This new advancement to their DNA-powered super-resolution imaging platform is an amazing feat that has the potential to uncover the inner workings of cells at the single molecule level using conventional microscopes that are available in common biology laboratories,” said Donald Ingber, M.D., Ph.D., who is the Judah Folkman Professor of Vascular Biology at Harvard Medical School and the Vascular Biology Program at Boston Children’s Hospital, and also Professor of Bioengineering at the Harvard John A. Paulson School of Engineering and Applied Sciences. To date, there are no methods that can quickly and accurately detect pathogens in blood to allow the diagnosis of systemic bloodstream infections that can lead to life-threatening sepsis. The standard of care for detecting such blood-borne infections is blood culture, but this takes days to complete, only identifies pathogens in less than 30% of patients with fulminant infections, and it is not able to detect toxic fragments of dead pathogens that also drive the exaggerated inflammatory reactions leading to sepsis.